The Bearded Pygmy Chameleon is a small species growing to a maximum size of 8cm. They have two large lobes on their chin, giving them their name. What does the Bearded Pygmy Chameleon look like? The Bearded Pygmy Chameleon resembles a wilted leaf. Colouration is variable with shades of brown, beige and green with dark lateral stripes or a lichen like pattern. Displaying males tend to have a yellow colouration, especially around the eyes. Present on the chin are two large lobes, this give easy identification. The maximum length of the Bearded Pygmy Chameleon is 8cm (3 inch). Where are Bearded Pygmy Chameleons from? Found living within evergreen rainforests of Tanzania on low branches and shrubs. How do you keep a Bearded Pygmy Chameleon? House Bearded Pygmy Chameleons in a glass enclosure as true pairs or trios. Although these are sociable, sight barriers should be provided throughout the enclosure. The use of live plants gives this a natural look or artificial décor can be used. Place at least a 3cm (1.2 inch) soil substrate with a layer of leaf litter and broken pieces of cork bark. The substrate must be kept damp at all times to help with the humidity and to provide suitable laying areas for gravid females. Humidity levels should be in the range of 70-100%, this can be maintained with regular misting. Temperature within the enclosure should not exceed 25C (77F), a daytime temperature of 22-24C (71.6 -75.2F) is ideal. Allow a night time temperature drop to between 16-20C (60.8-68F). A 2% UV light can be used to help plant growth and to light the enclosure, they rarely basks in the wild. 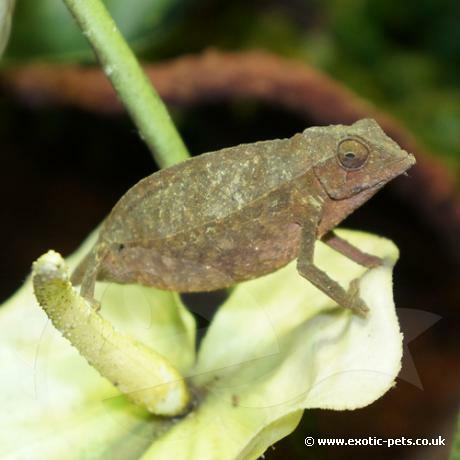 Bearded Pygmy Chameleons feed on a number of small insects by shooting out their tongue to capture them. A varied diet is important, food can consist of small crickets, locusts, mini mealworms, moths, spiders and house flies. When using commercial foods, coat the insects in a vitamin dust at least twice a week. Water must be provided by spraying the plants and décor around the enclosure or by providing a small waterfall. As with all Chameleon species, they need the movement of water droplets rather than a water bowl. We now provide a Pygmy Chameleon Starter Kit; this includes everything you need to get started for a small group of Pygmy Chameleons.